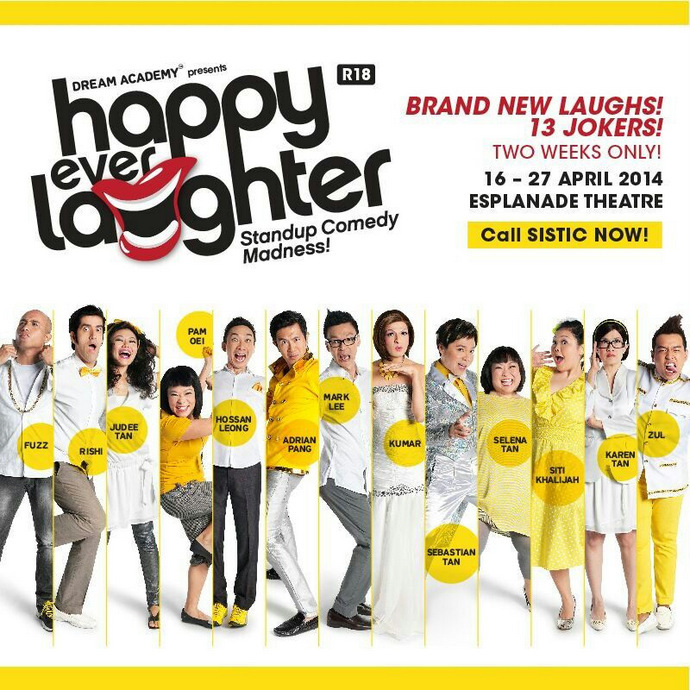 New standup comedy Happy Ever Laughter by Dream Academy will take to the Esplanade Theatre from 16 to 27 April 2014 . Directed by Selena Tan, 13 jokers will poke fun and bring laughter. Mark Lee, Adrian Pang, Sebastian Tan, Hossan Leong, Pam Oei, Selena Tan, Judee Tan, Siti Khalijah, Karen Tan, Zulkarnain Sadali, Fuzz, Rishi Budhrani and Kumari will joke about your mothers, the bus drivers, hawker centre ceilings, teenage girl-feelings, elections, erections (and they’re talking about buildings), expensive plates, cheapskates, racial tensions, political mansions, vexed preachers and match fixers. Shows are at 8 pm on Tuesday to Saturday with an additional show at 4pm on Saturday and a 2pm and 6pm show on Sundays.There will be an additional 4pm show on 18 April 2014. Tickets are available from SISTIC at S$47, S$67, S$87, S$107 and S$127.